Tonight is one of those nights where I find myself in a hotel room with some spare time, so I'm going to use to my advantage and knock out a few reviews before the backlog gets too big! 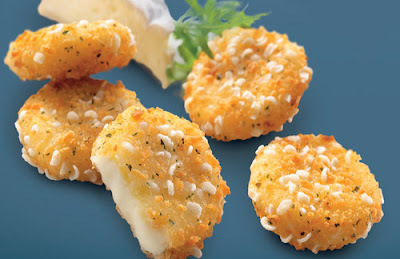 The first of which is another review from Oman, when I tried the Camembert Cheese Bites! Although I poked my head into a branch to check out the menu a few days earlier I didn't see any mention of these in store, nor on the website. This only popped up for a "Mothers Day" promo that any "mother" could get an order completely free, so The Wife, magically became The Mother, and we were given a free 5-pack. After investigation, the Cheese Bites actually launched in Oman in August 2015, and since all imagery was removed from every branch I looked at before and after this promo, it was clear this was a stock clearance for the single branch. Not that it made any difference to me, as this would be the only limited time item I would try on this trip! But there's actually quite a bit stuffed in there! Even though this was a free item, they were served hot and fresh, I half assumed they'd cook a huge batch in the morning and just give those away for the rest of the day, as who'd complain when they are free? We even had to wait a couple minutes for them to fry them up. The breading tasted like standard "mozzarella sticks" style batter, but it also had little pieces of cheese mixed in, which in all honesty I couldn't taste, but it did give the silver dollar sized bites a nice bit of class. The cheese inside was the real surprise, as it wasn't stringy or melted like in typical fried cheese sticks, but it was pretty much pure Camembert cheese. Not only did it taste like Camembert, but still had the semi-firm consistency of fresh Camembert even though the outer breading was piping hot. I had a similar reaction to the Mozzarella Sticks in Sweden, another one I liked. The problem with the cheese being so firm was that you ended up feeling like you were just eating blocks of cheese, and after 2 you didn't really want to have any more. Don't get me wrong, they tasted just fine, but how many pieces of plain cheese do you want in one sitting? The Wife and I ate two each and both were completely satisfied with that amount (we were also sharing the McArabia after all) so the 5-piece serving size might have been a bit much for a single person. The lack of any dip served, just to give the cheese some variation was probably it's downfall. One other interesting thing I found was that this wasn't the first time this promo was sold in Oman (and the rest of the Middle East). The Cheese Bites made an appearance in 2012, that time, complete with a box!